The person who created this batch of Pra Phong Supan was Jow Sahm PraYah - (Somdej Pra BoRonRahChaTiRaht Tee Sorng) from BE1967 to BE1991. Pra Phong Supan is not more than 600 years old and is roughly the same age as Pra Kru Wat RahBuRaNa in AuTaYah Province. Pra Phong Supan was made from the finest soil. It was found by a Chinese immigrant who stole into Wat PraSreeRaDtaNaMahaTaht, Supanburi Province in BE2456. 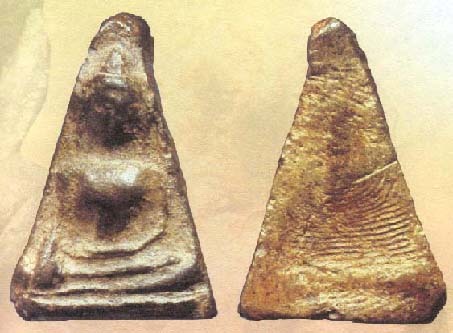 He dug up many types of old amulets from the Kru, and one of those amulet was Pra Phong Supan. When the Governor of Supanburi knew about the theft, he instructed his officials to open up the Kru and removed all the amulets for safe-keeping. The amount of amulets being dug out was plentiful, almost a cart full. The Kru was sealed up again after the amulets were removed. Pra Phong Supan has 3 different Pims; Pim Nah Gae (old face), Pim Nah Num (young face) and Pim Nah Glahng (centre face). The most popular is Pim Nah Gae and also the most expensive. Pra Phong Supan has 5 types of colour; See Daeng (red), See PiKoon Haeng (dry flower), See Liang (yellow), See Khiow (green) and See Dtum (black). One of the most expensive amulets in Thailand, Pra Phong Supan depending on the amulet's condition, costs between 100,000 to 1 000, 000 bahts. Besides being expensive, it is also one of the most difficult amulet to find. Most in the market now, are mostly fakes, even in some magazines, some pieces which are shown are also fakes.